Mt. Tabor, New Jersey, is a fine example of a 19th century community. Established in 1869 as a Methodist summer camp meeting ground, Mt. Tabor is now a full-time residential community. While walking through Mt. Tabor, one can see Victorian cottages, complete with gingerbread, and several historic community buildings. Trinity Park is still a busy and central focus of the community. In addition to residences surrounding the park are three octagon structures. The Mt. Tabor branch of the Parsippany library occupies one of them, once known as the Ebenezer Pavilion. The Bethel, a pavilion erected in 1873 and enclosed in 1886, is used as a community meeting hall. Historic displays are featured in the Bethel the day of the annual house tour. The Tabernacle, built in 1885, is used to host large community events, including concerts. The fountain in Trinity Park is a close replica of the original fountain erected in 1875. Throughout the 1870s and 1880s, private cottages were built at a rapid rate, while some summer residents stayed in tents. By the turn of the 20th century, more than 200 cottages were built, making Mt. Tabor a lively summer resort. The Depression and World War II brought some changes to Mt. Tabor: during these times when families could no longer afford two houses, the cottages were turned into year-round dwellings. Mt. Tabor is still a special community. Its historic heritage is being preserved and its community is full of good will and participation. There are many events each year, including Children’s Day, an annual Holiday Craft Fair, House Tour, and concerts. The many active committees in town include the Garden Club, Historical Society, and Children’s Day Committee. Mt. Tabor also has a golf course and country club. In 2001 we celebrated the reconstruction of a decorative iron arch at the entrance to Mt. Tabor closest to Dickerson Rd. at Rt. 53. The original arch was in place around the turn of the 20th century, and the reproduction was a project of the Mt. Tabor Historical Society and the Beautification Committee of the Camp Meeting Association. It was completed in June of 2001, and helps one to visualize how Mt. Tabor appeared to people arriving by train, as many did. This project was made possible by contributions from individuals, from the Camp Meeting Association, and from money the Mt. Tabor Historical Society raises from events such as the annual House Tour. We gladly accept donations toward the advancement of our mission. 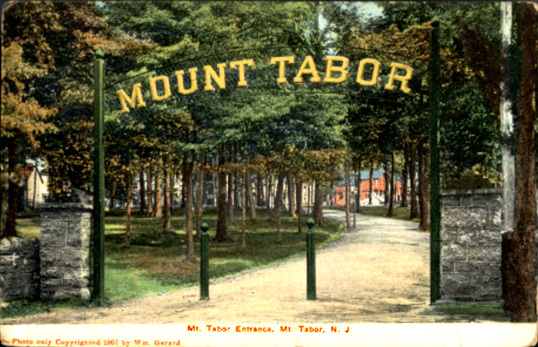 Read more about Mount Tabor’s history….